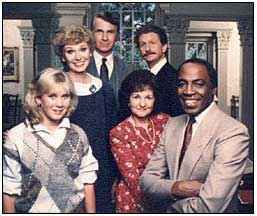 An unlikely spin-off from the off-the-wall, controversial series Soap, Benson was a more traditional sitcom that had Robert Guillaume continuing his role as the acerbic butler who resented working for self-involved, rich people. The premise of the show was that Benson had left Soap's the Tates to work in the Governor’s Mansion, only to find himself once again surrounded by wealthy incompetents. Topping the list was slow-witted Governor Gene Gatling, a widower who was cousin to Benson’s former employer, Jessica Tate. Not making Benson’s life any easier was the severe German housekeeper, Gretchen Kraus, who ran a tight ship and had no patience for Benson’s sarcasm. No less intolerant of the title character was snobby chief of staff Clayton Endicott III. Also on board was press secretary Pete Downey and the governor’s secretary, Marcy Hill. Fans with particularly good memories might recall that Jerry Seinfeld appeared on the show for a short time as the governor’s joke writer, Frankie. But it wasn’t all ruffled feathers. Not surprisingly, the fish out of water took to the governor’s precocious daughter, Katie. With a very busy father and no mother, Katie ended up spending a lot of her time with Benson, who despite his gruffness, genuinely cared for her. The relationship mimicked that of Benson and Jessica’s on Soap. Both Jessica (who was very child-like) and Katie allowed Benson to show a softer side. At the end of the 1981-82 season, Marcy (who had met and married a TV producer played by Ted Danson) left the show. Thanks to the logic of sitcom television, Benson went from being a butler to being the budget director of an entire state! Helping out was his sweet new secretary, Denise Stevens. Denise and Pete later married, and both left in the middle of the 1984-85 season. Even more incredibly, somehow Benson managed to become lieutenant governor of Connecticut, and Mrs. Krause became Benson’s executive aide. To top it all off, Benson finally found a girlfriend in legislator Diane Hartford. Perhaps this was all too much for Benson, because eventually he got power hungry and ran against Gatling for governor. So who won? Well, it seems the show’s producers couldn’t decide either, so they filmed four different series endings. One had Benson winning, one had Gatling winning, one had both losing to a third candidate, and the fourth had both men watching the returns with no winner announced. The producers decided to air the fourth ending.